Specialists in hygiene, garden maintenance, and cleaning services for commercial and industrial businesses. We are committed to our customers, and our primary objective is complete customer satisfaction. Dynamic Cleaning Services focuses on interpreting and understanding our clients' needs and business environment. Our highly-focused team ensures that customer satisfaction and interaction is consistent and positive. With our shared experience and knowledge we are able to create a solutions-based environment in which flexibility and co-operation are key. To offer a preferred and reputable service with quality and customer satisfaction at the forefront. To create work and train the previously disadvantaged while providing an exemplary service. To provide excellent value and customer service to our clients. 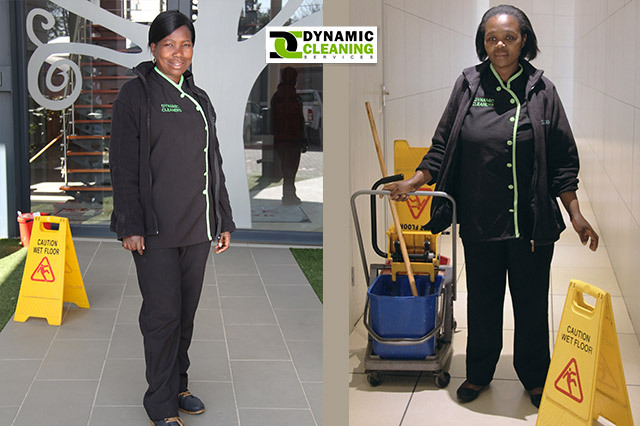 Dynamic Cleaning Services specialise in commercial cleaning and gardening services. The founding members of our company have a collective and extensive background in marketing, sales, retail, advertising, promotions and public relations. The team's total experience was gained in formal corporate environments, like your own. Ability to speak comfortably and confidently to clients.